Toronto dinner cruise is a great way for spending a romantic evening or enjoying unforgettable time with friends and family. For those who want to spend little extra time (and of course money!) than the regular sightseeing harbour cruise, Toronto dining cruises offer great experience aboard. DJ entertainment, dance, mouth-watering food, drinks and spectacular views make your cruise experience truly amazing. You can select a lunch or dinner cruise, both of them last about 2-3 hours. But Toronto dinner cruises are usually more elegant and offer best evening and night views of the city. If you want to spend a beautiful summer day in a special way, Toronto dining cruise is an excellent choice for you. Hop aboard a wonderful cruise ship for a magnificent and memorable dining experience. You can choose a lunch cruise or a weekend brunch cruise and savour freshly prepared gourmet food and drinks while enjoying breathtaking views Toronto skyline and charming Toronto Islands. On board, you will travel along Toronto Harbour for 2 hours and enjoy unobstructed views CN Tower, Rogers Centre, Harboufront Centre, HTO Park, Sugar Beach and the historic Gibraltar Point Lighthouse. The sumptuous brunch menu include continental bakery items, fresh fruits, garden vegetables, fries, assortment of salads, waffles, scrambled eggs, meat and freshly brewed coffee and various herbal teas. The buffet lunch features mixed green salad, pasta-bean salad, red potato salad, roast beef, chicken, vegetarian rice, delicious deserts and fresh coffee. You can purchase a drink from the full bar (but little expensive). This is a decent Toronto dining cruise with good vibes and efficient service. But don't expect any extravagant luxury and ambience. 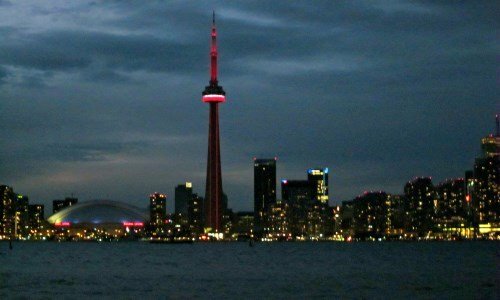 The Toronto dinner cruise is a more classy and luxurious cruise than the one above and offer best of the both worlds  mind-blowing, natural views of sunset in the evening and dazzling views of Toronto skyline in glowing night lights. Grab a drink and enjoy views of city skyline and watch the sun setting below the horizon from the outdoor viewing decks or indoor cabin. 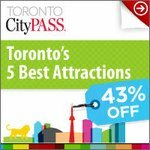 You will get plenty of opportunities for postcard perfect photographs as you pass Toronto landmarks such as CN Tower, Rogers Centre, HTP Park, and wonderful Gibraltar Point Lighthouse. Now it's time to tantalize your taste buds with gourmet buffet dinner freshly prepared by the chef on board. The buffet dinner features assortment of goodies including appetizers, variety of salads, carving of roast beef, grilled chicken, fish, potatoes, grilled vegetables, fresh fruits, cake, cookies and coffee. After the lavish dinner, dance under the stars with live music and DJ entertainment or just sit back, relax and enjoy cool breeze. Indeed, this Toronto dinner cruise offers lots of pleasant memories that you can cherish for a long time. Additional Info: The cruise cost includes reserved seating, buffet dinner and DJ entertainment. Smart casual attire preferred.